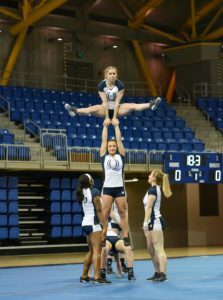 The Quinnipiac acrobatics and tumbling team made it two wins in a row with a 284.01-254.635 win over King University on Saturday in Hamden. The Bobcats (2-1) controlled the scoreboard for the entire meet and swept every event going a perfect six-for-six including the Team Event. The team only lost one heat on the day. The Team Event saw the Bobcats winning by almost 15 points over the Tornado (0-3) and cracking 100 for the first time this season. Coming into the meet, the Bobcats hadn’t scored more than 281 points in a meet since the 2015-16 season. After the meet, not only did they win their second game in a row surpassing 280-points, but they surpassed 281 as well. However, there was a scary moment during the second heat of the Toss Event. King University freshman base Kaylee Reese got hit in the face as the top was coming down and instantly fell to the ground. Reese got up and walked off under her own power. She remained out for the remainder of the meet, but was standing on the sideline cheering on her team during their run at the Team Event. The Bobcats take the mat next on Sunday, March 11 at Oregon University. Oregon owns a 2-1 record with their only loss coming against Baylor (4-0). Both teams scored over 280-points.